The 2014 World Cup tournament will get underway in Brazil on June 12th. You can follow all the action in the international football tournament with the World Cup 2014 schedule. Whether you want to follow your favorite team or your bitter rivals, the instantly-downloadable World Cup 2014 schedule tracks all the action. With the World Cup 2014 schedule table, you can also monitor the standings through the round of 16, quarterfinals, semifinals and the final match. The 2014 World Cup schedule template is available as a free download here on this page. Download, save and print the World Cup 2014 schedule from PrintableBrackets.net today! Group stage play for the 2014 World Cup will begin when host nation Brazil battles Croatia on Thursday, June 12th. Group play continues the next day with three matches on the World Cup 2014 schedule and runs through June 26th. The third-place match will take place on July 12th, while the championship match in Rio de Janeiro will be on July 13th. Brazil enters to the World Cup 2014 tournament with more overall success in the tournament than any other nation. The Brazilians have won the football spectacle a record five times while also placing second twice and third three additional times. Brazil is also the only country that has played in every World Cup since the tournaments inception in 1930. Italy prepares for the World Cup 2014 schedule second on the all-time title list with four. Italy last won the event in 2006. Germany is alone in third on the all-time list with three titles. Spain comes into the 2014 tournament as the defending champion. The Spaniards beat the Netherlands, 1-0, in the 2010 final match. The United States hasn’t fared very well in previous World Cups. The Americans’ highest finish in the event was third place in 1930. Team USA hasn’t finished in the top-4 since. 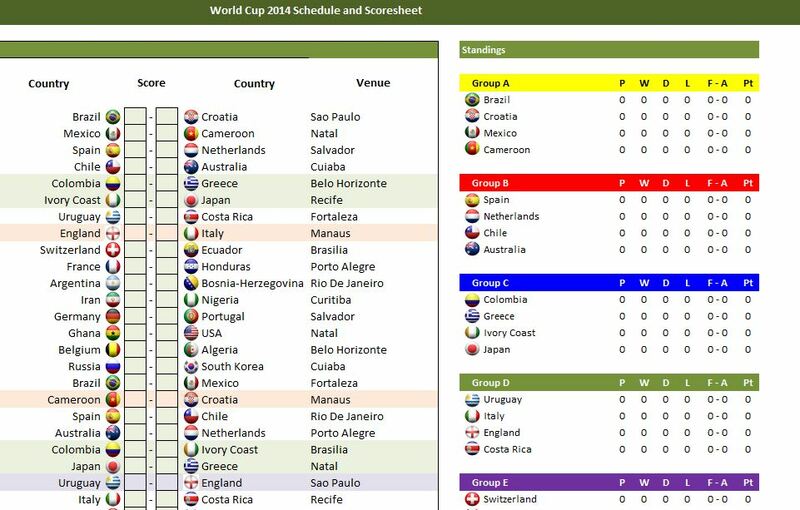 Note: Credit to ExcelTemplate.net for use of 2014 World Cup Schedule Template.